The federal budget passed, this week, not unexpectedly, with the Conservatives and Bloc Quebecois voting in favor and the Liberals and NDP, against. Where was the fiscal conservatism of Prime Minister Stephen Harper in all this alleged spending. After all, was it not he who made the major theme of his masters in economics thesis, at the University of Calgary, the folly of governments who upset the natural economic cycle by heavy pre-election spending? It would take more than a two-paragraph analysis to demonstrate how much of the currently-passed budget was in harmony with the economic cycle, as economist Harper would have wished, or in defiance of it, as the politician in the prime minister might be tempted to foster. If, indeed, the budget is out of whack with the natural market cycles, it might well take a while to find out what the government will do to correct the trend. In the past, particularly under the governance of a more interventionist type of prime minister — to wit, Pierre Elliott Trudeau — such measures as the National Energy Policy and wage-and-price controls were used as correctives. And, in the view of fiscal — and social — conservatives, such corrections and re-corrections led ultimately to a state-controlled kind of economy and society that has taken a couple of decades from which to unwind. To add to the irony of the economic discussion around the budget, it is noteworthy that Bill Blaikie, the longest-serving current member of the House of Commons, announced, last week, his intention to retire from parliament, so he can teach theology at the University of Winnipeg. Blaikie is an ordained United Church minister and an articulate defender of the social gospel concepts advocated by NDP founder Tommy Douglas, who, himself, was a Baptist clergyman. Blaikie told Don Newman, host of CBC’s daily Politics television program, that he hopes to build the case for the idea that Christians interested in public policy issues should be prepared to espouse the causes of the “Christian left.” And he speaks out of a deeply devout personal Christian conviction that, at times, would make him sound more like a serious evangelical Christian. Blaikie, in defending the Christian left, will often refer to what he describes as “market idolatry” — the fiscally-conservative practice of relying on those natural market forces referred to above, to make economic decisions. He and Harper, the economist, could well argue until kingdom come, about whether paying attention to market forces is “idolatry” or measured observance of reality. But, as long as right and left can keep talking, both perspectives act as checks on the potential for abuse on either side. That is what collaborative governance, with some added conciliation in the mix, can do for a nation. Meanwhile, among the faith-based initiatives popping up around The Hill this week, was one coming from a senior statesman in the charismatic Christian community, David Mainse. Mainse and I share the distinction of being members of the ‘Zipper Club’ — that elite group who have benefited from the kind of heart surgery that required the opening of the chest cavity. Shortly before my surgery, last summer he called to encourage and pray for me. He told me the operation would be a “piece of cake”, a suggestion which I greeted with some skepticism. Mainse’s visit to Ottawa, this week, is part of a cross-country tour which he hopes to turn into a book about how to balance the prophetic with care and compassion, in seeking to influence the shape of public policy in Canada. His modus operandi in each city is to meet with — and listen to — a group of Christian leaders whose commonality is the desire to bring “the prophetic” to bear on public policy issues. In Ottawa, his host was a group called ‘Mission O’ (the O being for Ottawa/Outaouais), a bilingual group of pastors and other ministry leaders from the National Capital Region. Barry Boucher, the pastor of Life Centre, a large eastside semi-independent Pentecostal Church, leads the group. It works from a data base of 400 ministers, of which 100 or so are regular attenders at Mission O events. Mainse began the session with a short voice clip from Prime Minister Harper, supplied at Mainse’s own request. Harper wished him well in his meetings and stated, as he has often done, that faith-based people have every much as much right as anyone else, to exercise that faith — and to work together for the common good. That clip was followed by a longer video from Bishop Fred Henry, who leads Catholics in the Calgary diocese. Henry urged Christians, no matter their religious and political affiliation, to be prophetic and to speak Christian stances into the wider community. Following those clips — and a lunch of quiche and salad that may or may not have been good for ‘Zipper Club’ members in the room — the crowd was broken out into table discussion groups, where the questions at hand were discussed. A recorder took notes which were turned over to Mainse at the end of the session, for adding to his data base. In some ways, the timing of Mainse’s visit was good, given that it was just a few days after the release of Amazing Grace, the William Wilberforce movie. Edna and I took in Grace on the weekend and were both moved by it. So it was helpful to be in the Mainse session, surrounded by so many others who had also seen it, and could relate the issues it raised to the concerns that Mainse wanted to bring to the “listening” table. 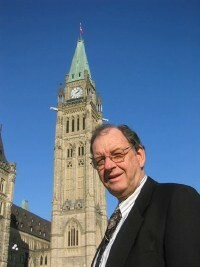 Lloyd Mackey is a member of the Canadian Parliamentary Press Gallery and author of Stephen Harper: The Case for Collaborative Governance (ECW Press, 2006). He can be reached at lmackey@canadianchristianity.com.